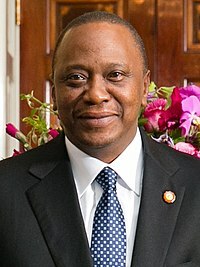 English: Uhuru Muigai Kenyatta (born 26 October 1961) is a Kenyan politician who was elected as President of Kenya in March 2013. He has served in the government of Kenya as Deputy Prime Minister since 2008 and was also the Member of Parliament for Gatundu South Constituency. Kenyatta also served as Chairman of Kenya African National Union (KANU), which was a part of the Party of National Unity (PNU). Media in category "Uhuru Kenyatta"